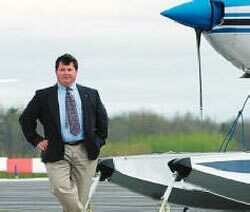 "An FBO Provides the Heartbeat of an Airport"
Lakeshore Aviation is committed to providing world-class FBO services to local and visiting pilots, promoting Manitowoc County, and supporting corporate and general aviation. We will endeavor to share the joy of flight with all interested in Aviation. Lakeshore Aviation will work tirelessly to become recognized as a premier FBO in the Midwest. Our business efforts will revolve around bringing more business to the airport, supporting General Aviation, assisting the county and cities in attracting businesses through quality aviation services focusing attention on the Manitowoc County area. Thank you for taking time to visit our website. We hope this little "visit" to our company provides you with a glimpse of the enthusiasm we have for our business, the passion we have for flying and the dedication we feel for our customers. When we opened our doors eight years ago, we decided that "An FBO is the Heartbeat of an Airport." We went about hiring the best people we could find, offering the best fuel program we felt was available, and started up the most exciting flight school around. We renovated our building....everything from new logos, signs and art to the carpet, paint and lighting. We've got a top-notch facility, and we're very proud of it. It's part of being at a top-notch airport. Since then, we've won awards, expanded our hangars, added to our rental fleet, earned an Air Charter certificate, expanded our charter fleet and trained 100's of student pilots. Through all that, most of our original staff is still with us...and we're quite proud of them! Next time you stop in, please feel free to ask our staff for any help you need. Whether it's fueling up your pride and joy, finding a book or a nice little gift in our pilot shop or taking your first flight lesson, we hope we meet your expectations. We take pride in what we do here, and want to share it with everyone. We're also equally dedicated to supporting our community. We are active with city and county government. We participate in many Chamber of Commerce activities. We proudly host the Thunder on the Lakeshore Manitowoc Airshow. And most recently, we undertook the lead to help create additional jobs and businesses here at our airport. We want our airport to be a vital part of our community...a center of activity that we can all be proud of. So next time you're flying nearby, feel free to stop in and say HI. If you don't have time, just grab the mike and holler down to us on the Unicom (122.8) and say HI! We're always happy to hear from our friends, and there's always a smile waiting for you on the other end. Thanks for taking your time to visit with us.